The National Institute for Occupational Safety and Health and OSHA have collaborated to update OSHA’s original Heat Safety Tool. 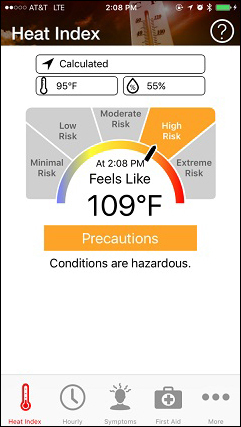 The updated app, available for both Android and iPhone, provides a clearer user interface, while still providing the same information to help keep workers safe when working outdoors in hot weather. Extreme heat causes more deaths than any other weather-related hazard; each year more than 65,000 people seek medical treatment for extreme heat exposure. More than 450,000 users have downloaded the original app since it was launched in 2011. The original OSHA app will no longer function after September 30. To download the updated app and get more information on OSHA’s efforts to help protect workers from the heat, visit our heat campaign webpage. In our last issue, we asked employers and safety professionals to tell us how they are keeping workers safe from extreme heat. Below are a few examples of the responses we received. For more, and to submit your own, visit our heat campaign webpage. Land of Lincoln Goodwill Industries in Springfield, Ill., implements a buddy system within shifts so that workers can keep an eye on each other and report to their supervisor if they notice symptoms of heat illness. It is the company’s policy that new and/or transferred employees be acclimated to the environment by getting frequent breaks during their first two weeks on the job and during heat waves. The company also equips workers with cooling caps and bandanas, and provides earlier shifts and additional breaks, water and sports drinks on days when temperatures are expected to be especially high. Throughout the summer the company sends text messages/emails, and gives posters and toolbox talks to keep workers alert to the hazards of heat exposure. 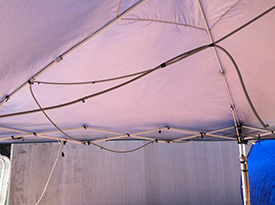 Ballard Marine Construction uses canopies equipped with hoses to provide its workers with shade and cooling mist that protect them from the heat. With Independence Day celebrations approaching, OSHA is encouraging the fireworks and pyrotechnics industry to protect workers from hazards while manufacturing, storing, transporting, displaying and selling fireworks for public events. OSHA offers information on common hazards and solutions, including downloadable safety posters for workplaces. 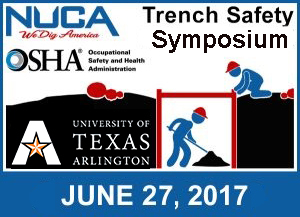 Join the National Utility Contractors Association, OSHA and the University of Texas at Arlington on June 27, 10:00 a.m. – noon ET, to learn ways to reduce trenching and excavation hazards. Cave-ins and other trenching hazards often lead to fatalities and serious injuries, which are preventable. This free Trench Safety Symposium conducted by industry representatives is being held in support of the National Trench Safety Stand-Down. You can register online to participate or call 866-906-9190 for the video link. OSHA and Health Canada are continuing joint efforts to align hazard communication regulations for workplace chemicals in the United States and Canada. The agencies will host a webinar June 28, 1:30 – 2:30 p.m. ET, to provide stakeholders with an update on current and planned guidance materials. The webinar will also address regulatory activities to align with the most recent version of the United Nations Globally Harmonized System of Classification and Labelling of Chemicals. Details about how to participate are on OSHA’s Hazard Communication webpage. The Appalachian Service, Transmission, Exploration and Production Safety Network signed a two-year agreement to provide oil and gas drilling and servicing employers, employees, and others with information, guidance, and access to training resources that will help them protect the health and safety of workers. The agreement was made through OSHA’s Alliance Program, which fosters collaborative relationships with groups committed to worker safety and health. Alliance partners help OSHA reach targeted audiences, such as employers and workers in high-hazard industries, and give them better access to workplace safety and health tools and information. Sanford & Hawley Inc. is a retail lumber and building materials supplier based in Unionville, Conn. The company also operates lumber yards and stores in Avon and Manchester, Conn., and in West Springfield, Mass. All four of the company’s facilities are Safety and Health Achievement Recognition Program participants. The company learned about SHARP through working with OSHA’s On-site Consultation Program to identify workplace hazards and establish an effective safety and health program. In addition to keeping workers safe, the improvements that earned the company SHARP status also helped reduce costs associated with on-the-job injury claims, incident investigations, medical care, days lost, and workers’ compensation premiums. For more information, see the success story. A machine operator working for an electrical cable manufacturer was fatally crushed after being pulled into a cable wiring re-spool machine. OSHA inspectors cited Milton, Fla.-based Gulf Cable LLC for 12 violations including failure to install machine guarding to prevent contact with moving parts and failure to have a plan to prevent machines from starting while being serviced. The company also exposed workers to electrical shock hazards by failing to replace cut wiring. Gulf Cable was proposed fines totaling $226,431. Read the news release for more information. The Virginia Occupational Safety and Health Program issued $84,000 in penalties to Georgia Pacific in Big Island for safety violations discovered after a fatal incident in November. VOSH inspectors determined that the company had removed a nip roll guard from a floor opening, and six days later, a worker servicing a paper machine fell through the unguarded hole into a pulp tank and drowned. VOSH inspectors issued citations to the company for two serious and one willful violations. A new factsheet explains how to protect workers from the primary dangers associated with spray painting marine vessels. These include fires and explosions from flammable paints and coatings, as well as exposures to chemical hazards and toxic substances. The fact sheet also explains the necessary precautions employers must take to safeguard workers, which include identifying and evaluating exposures to respiratory and other hazards. Where appropriate, employers must also ensure that chemical labels and safety data sheets are made available to exposed workers, and offer workers training on the hazards.